Raise Breast Cancer awareness on the lanes using this bowling ball! Hello! 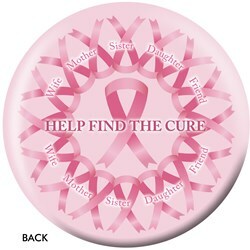 Unfortunately, at this time, Bowling.com will only carry plastic/spare balls with the breast cancer logo. Due to the time it takes to produce the OnTheBallBowling Every Ribbon Tells A Story (Breast Cancer) ball it will ship in 1-2 weeks. We cannot ship this ball outside the United States.